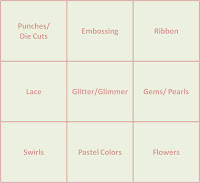 This week at 2 Sisters we have a BINGO card challenge. You have your choice of any 3 that you want to do off the bingo card but like bingo theymust be in a row Everone that enters will have a chance to win some goodies from Robyn's Fetish. 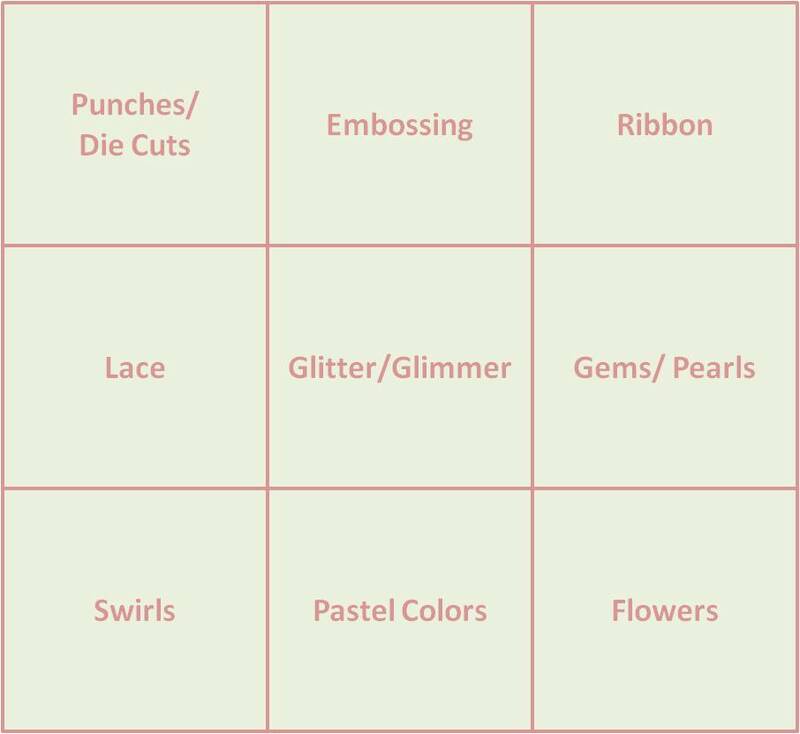 But in addition to the that prize anyone who enteres a card/project using all 9 bingo squares will have a chance to win some goodie from Pizzazz Aplenty. For my card I used all 9 bingo squares. The base of my card is pastel yellow backed in sugar n spice (pink). I embossed a strip of pastel purple using a cuttlebug embossing folder (swirls). I added a border to the top and bottom of the strip of embossed cardstock. I punched the border out using an eyelet lace border punch and added a piece of light blue ribbon at the top and bottom of the purple cardstock. I colored the image (Easter Girl from Robyn's Fetish) using crayola and prisma colored pencils. I backed both the image and the sentiment in sugar n spice. I added a pink paper flower and a yellow paper flower. In the center of each flower I added a 6mm white heart pearl. I also added 3 of the white heart pearls to the bottom of the card. I added crystal stickles to the edges of the paper flowers, the center of the flowers on the image and to her wings. Beautiful card you made. Very sweet image you used. The embossed paper looks pretty on the white boarder. Thank you for joining us at Stamptacular Sunday Challenge. This card has it all!! Awesome job on using all 9 squares. You pulled it all together so well. Glad your card was able to fit into our challenge of Girls & Swirls. Love how you added the swirls as the embossing. great touch. Thanks for sharing your awesome creativity with us this week at Stamptacular Sunday challenge! Adorable card!! Very sweet! Thank you for playing along with my flutter by challenge! Aw, what a sweetie. 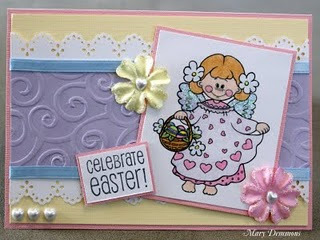 Your colors are perfect for Easter and I love the pearl hearts! Thanks for joining us at Stamptacular Sunday Challenge. Super sweet card! Thanks for joining us at Flutter By Wednesday.